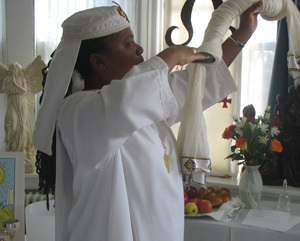 Lyratah has studied many spiritual paths and traditions for over 30 years. Through meditation and personal disciplines with her life long teacher Shakmah Winddrum and other spiritual teachers, she has evolved and deepened. For over seven years Lyratah has been teaching on the topics of Ageless Wisdom and meditative practices at New Seed Sanctuary in Lansdowne, PA where she serves as teacher and Director. An ongoing series of courses are offered throughout the year, as well as study groups, support groups, counseling sessions and meditation classes. As a trained ceremonialist and minister, Lyratah offers her services as an officiant for weddings, civil unions, funerals and rites of passage. Private counseling sessions are available by appointment. Lyratah is warm, caring, and engaged with people. She sees everyone as an expression of the Divine, each having an important piece and part to share.